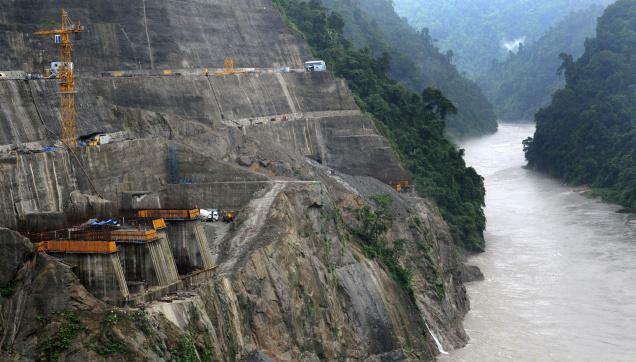 With the construction of India’s largest dam – the 2000MW Lower Subansiri project in Arunachal Pradesh coming virtually to a standstill – the National Hydroelectric Power Corporation Limited (NHPC) has sought to resume work at the site by reassuring people that the public sector unit has put best engineering practices in place to ensure safety of the project. Work at the project site in Gerukamukh, close toAssam border, had come to a halt in December, 2011 because of stiff opposition from anti-dam groups in Assam, fearing safety of the dam because of its location at the seismically sensitive spot and its environmental impact on the downstream areas. On Thursday, the NHPC roped in technical experts from various central institutions to highlight the point that the dam has already incorporated sufficient measures to withstand high-seismic activities and the authorities were ready to include additional safety measures. However, even as a seminar on “development of large hydro power projects in northeastern region (Subansiri Lower Project)” was underway, anti-dam activists, led by Akhil Gogoi, staged a sit-in at the venue. The protestors were demanding implementation of recommendations made by the Thatte and Reddy Committee formed by the Planning Commission. Rejecting suggestions of the Dam Design Review Panel on grounds that its members were part of various committees formed earlier by the NHPC, they demanded a tripartite meeting between the Prime Minister, Assam government and representatives of people living in the downstream areas. “The Centre should not go ahead with the construction of the dam in the Brahmaputra basin until our demands are met,” Akhil said. “In our country, we have a long tradition of building high concrete dams on relatively complex geological formations which have withstood the test of time. Bhakra and Koyna dams are testimony to this fact,” former Central Soil and Materials Research Station director V M Sharma said. Technocrat and former vice-chancellor of Gauhati University N K Choudhury said, “We need to address the doubts raised by people. I am happy that the NHPC has taken the initiative to reach out to the people,” Choudhury said.